The sun is getting warmer, the birds are chirping and the winter blues are starting to melt away - and what better way to celebrate the warmer weather than with a meander through the winelands. But if you really want to get in touch with your hippie side to spring-clean the soul and the planet, why not go on a green wine route tour where vineyards are the leaders in sustainable and environmentally friendly practices. These are the farms that normally grow organic grapes, use no pesticides and use au-naturale pest control like bug-munching ducks. They want to work with nature instead of against it, which not only produces healthier crops but also is less poisonous to the environment and the people who live around the farm. Not only can winemakers look at making their vineyards eco-friendly, they can also set aside wilderness areas for conservation and grow their own vegetables for their cellar restaurants - creating a cycle of green wine and sustainable deliciousness. If you want to give Mother Nature a present for spring, take a detour to these green wine farms. Longridge Wine Estate has been living their organic philosophy for a while now, and for them it’s only brought good things. They use natural methods to cultivate their wine, and instead of pesticides they use geese to get rid of unnecessary pests. They've been certified organic since 2015, and their most known for their award-winning chardonnay. 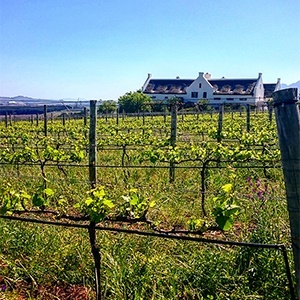 On the slopes of Botmaskop overlooking Banhoek Valley is the quaint wine farm of Bartinney. Its winemakers focus on its energy consumption in farming and winemaking, and through its solar-powered methods is 100% carbon neutral. It has a Champion Status in the Biodiversity and Wine Initiative - a partnership between the wine industry and conservation partners - for its programmes that uplift the region's poorer communities and makes sure that the wildness of Banhoek Valley remains protected. Many sections of Wedderwill on the Sir Lowry's Pass are conserved to protect the area's unique Boland granite fynbos and the special habitats on the banks of the pass's river. Its name means 'will of the weather', very fitting as the winemakers work with the weather to grow their tough grapes through storms and sunshine. It also has olive groves, a game camp and a herbarium that was established in 2005 so that plants and species of exceptional botanical value that grow on the farm can be recorded. Ken Forrester is known in the wine world as the 'Chenin King', and although not labelled as organic his wine farm does not use any pesticides or herbicides, relying on ducks to keep the bugs in check. The soil is also worked by hand with hoes, and the farm is part of The Wine and Agricultural Ethical Trading Association, making sure that all wine is produced ethically. It has some of the best wooded and dessert Chenin in the country, and a trip to its tasting room gives you a chance to get a glimpse of their exclusive wines only available at the farm. Org de Rac call themselves the 'green heartbeat of the Swartland. The youthful farm has won multiple eco-awards in a short space of time for their refusal to use any chemicals. All grapes are hand-harvested, sorted and all production up until the final bottled wine is done on-site, cutting down on energy consumption. Besides tasting guilt-free wine, visitors can also roam around the vineyards to try and spot herds of bontebok and springbok or buy some organically certified olive oil and other products that are also produced on the farm. Nestled in the foothills near the Ceres Valley is a wine estate with a difference - organic wines are produced locally in order to bring a true South African flavour to the table. It has been fully functional since 2000 and produces wine with 50% less sulphur than usual wines. All of its wines are handcrafted and only natural sources of copper are used in the production. The most popular wine is the red selection. Waverley Hills was also instrumental in the cleanup of the Breede River in its area, playing a key role as custodian and educator about environmental awareness. Its onsite restaurant focuses on organic, fresh ingredients that are always seasonal, it menu changing many times throughout the year. The Cluver family has owned this piece of land since 1896, and its greeny finger comes from its conservation efforts protecting the UNESCO world heritage site - the Kogelberg Biosphere. The wine farm falls under this conservation section, and parts of the farm have been set aside for protection in perpetuity. The current Cluver running the family business is also an avid supporter of conservation projects, having started many of his own volition - like the founding of the Groenlandberg Conservancy. Beyond conserving its precious fynbos, Hermanuspietersfontein Wingerde also wants to make a home for the fauna that lives on its mountain slopes - like leopards, duikers and baboons. They are allowed to roam freely through the vineyards, which is planted in such a way as to accommodate natural fynbos pathways and corridors. Ducks are in charge of snail control, and earthworms till the soil to ensure it's healthy for growing juicy grapes. If you want to make a weekend of it you can enjoy its natural splendour for a night or two at one of the farm's self-catering cottages. Find Your Escape with our Traveller24 Weekly Newesletter - Subscribe here. Or download the News24 App here, to receive expertly curated travel wanderlust directly to your mobile.